As has been the trend for most of the week, the main concern for launch were showers and thunderstorms within 20 nautical miles of the Shuttle Landing Facility (SLF), flight through precipitation, and cumulus clouds. As such, there was only a 30 percent chance of favorable weather by the time Atlantis was due to launch, with a window opening at 1121 EDT. S0007 (Launch Countdown) tasks have proceeded without any major issues, with the PRSD (Power Reactant Storage and Distributation) cryo load, LO2 and LH2 Preps for ET load, and ET feedline inspection and Borescope inspection of SRB crossovers all completed. The FRCS (Forward Reaction Control System) Tyvek covers were installed. However, due to a failed pull test some of the covers were reinstalled. COM activation was completed on Thursday morning, leading up to the next milestone, which was the retraction of the Rotating Service Structure (RSS). 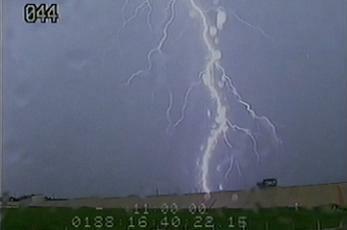 This operation was moved around on the timeline due to storm weather in the region, which produced a very strong 70,000 amps lightning strike – one of two observed by the array of monitoring equipment – inside the Pad 39A complex. Thankfully, an Engineering Review Board (ERB) meeting later in the day cleared the stack from any ill effects from the event. Four new Interim Problem Reports (IPRs) were listed by the NASA Test Director (NTD), the latest of which on Thursday – IPR-59 – has since been resolved. “IPR 0059: The IPR was taken to document the loss of all three facility chillers at Pad A. Initially Chiller #2 dropped offline and subsequently Chillers #1 and #3 failed to startup properly. No cooling violations were violated on GSE (Ground Support Equipment) or Flight hardware,” noted the NTD report (L2). The Tanking/Weather Brief MMT meeting took place at the Kennedy Space Center (KSC), with a GO/NO GO decision expected between 1:30 and 1:45 am local time. The decision came slightly later, but in time to allow an on-schedule tanking at 2:01am Local. ET-138 went into LH2 topping 15 minutes ahead of schedule, with no issues noted on either the GUCP (Ground Umbilical Carrier Plate) – via the leak detectors, or the Main Fuel Valve (MFV) on SSME-3 (Space Shuttle Main Engine). Tanking operations were completed, with ET-138 under stable replenish. 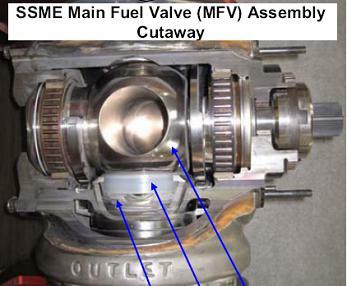 Only one issue was worked shortly after tanking, relating to a Left OMS valve opening “unexpectedly” – a condition which has not previously been observed at this stage of the countdown. After backtracking to check what may have caused the valve opening, the Data Processing System (DPS) noted a nominal trigger related to tank pressure. Thus, this incident was not classed as a concern for launch. A 7:30am Eastern meeting discussed the latest weather forecasts, with a potential decision point to scrub or proceed with the countdown. The meetings decided that the countdown would continue, in the hope of acceptable weather at T-0. 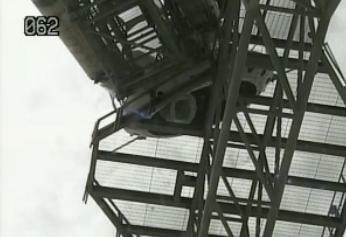 A failure of a LOX pump at the pad was also resolved, after a bearing problem required the swap over to the redundant pump. The swap only took 21 minutes out of the LOX stable replenish, resulting in no constraint for launch. With the weather continuing to trend in the right direction, polling allowed Atlantis to come out of the T-9 minute hold, prior to a failure being noted on the loop, preventing the countdown to enter the Autosequence Start at T-31 seconds. This was related to a bad indication relating to the GOX Vent Hood arm. However, visual indications showed the system was out of the way, resulting in controllers picking back up the count within the window, as Atlantis’ SSMEs fired up and her SRBs came to life to launch uphill. 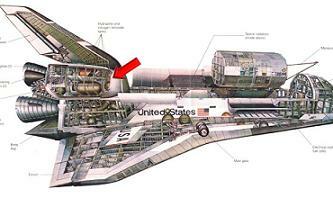 Only a transducer was noted as failed during ascent, requiring no action, as the vehicle powered to Main Engine Cut Off (MECO) and into Flight Day 1 of STS-135. Further updates will follow. Refer to the live coverage threads for up to the second – and the fastest turnaround of information anywhere on the internet – updates. 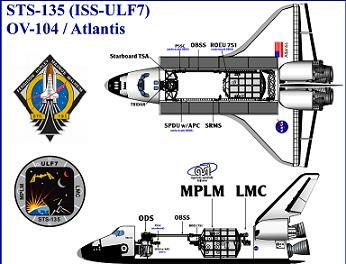 For the STS-135/ULF-7 (Utilization Logistics Flight 7) mission, the Space Shuttle orbiter Atlantis (OV-104) is carrying the Multi-Purpose Logistics Module (MPLM) Raffaello – with supplies, logistics, and spare parts – and the Robotics Refueling Mission (RRM) to the International Space Station and return the MPLM Raffaello and the failed ammonia Pump Module from the Station. For Launch Countdown (LCD) S0007 operations, the STS-135 mission had a nominal 70hour 21minute short window countdown. The LCD did not include a PRSD (Power Reactant Storage Distribution) system offload, and the built-in hold at T-19hrs was only 4hrs in duration. In terms of launch windows, there were several two-pane days with FD4 (Flight Day 4) rendezvous opportunities available on multiple dates throughout the duration of the July launch window. For the opening launch day on Friday, July 8, there was a two-pane availability for FD-4 rendezvous, which would have added approximately 3mins of additional launch time on July 8 – bringing the total available launch time to 13 minutes. However, FD4 rendezvous WILL NOT be utilized for the July 8 launch attempt. As such, only 10 minutes of launch window was available on July 8 to support FD3 rendezvous. While the actual down-to-the-second launch time is usually adjusted on the day of launch at the T-9min and holding mark, the pre-flight in-plane preferred launch times for the July 8-10 launch window are: July 8 at 11:26.46 EDT, July 9 at 11:04.14 EDT, and July 10 at 10:38.30 EDT. On July 8, the entire FD3 rendezvous window extends from 11:21.46 EDT to 11:36.46 EDT. Likewise, the July 9 and July 10 attempts – now no longer required – both had 10 full minutes of launch window, with the preferred in-plane launch time falling in the dead center of the window. The actual launch windows on those days may have been shorter than the pre-LCD value due to limited vehicle performance, day-of-launch (DOL) phasing constraints, and DOL parameters. Following July 10, NASA would have had to stand down launch operations of Atlantis as a Delta-IV rocket carrying a GPS IIF-02 satellite has Eastern Range launch priority from July 11-15. In the end, Atlantis launched at the first time of asking, removing further window evaluations. 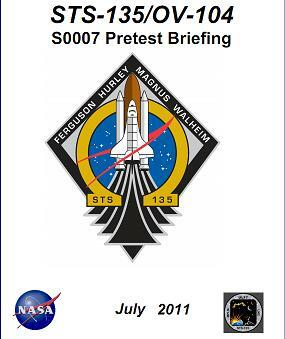 As part of the standard pre-STS-135 S0007 operations, the STS-135 Pretest Briefing reviewed all special topics for the STS-135 launch campaign. This note was in reference to the small top-coat damage that occurred to a TPS (Thermal Protection System) tile around orbiter Endeavour’s crew hatch during catch closure operations on the May 16th launch attempt. The top-coat damage was quickly repaired with a quick-curing thermal agent and launch proceeded without further issue. Another special topic reviewed by the S0007 Pretest Briefing was the total lifetime runtime of Fuel Cell 2 (FC-3) on Atlantis. 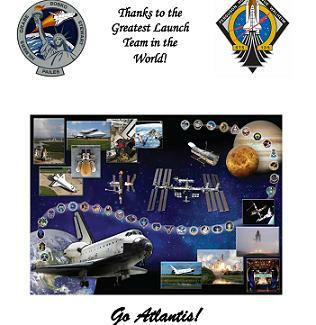 Lastly, the briefing notes that “Search 4 will be flying from ~0530 EDT with video equipment to document Atlantis on the pad, landing convoy as well as crowds in Titusville, Cocoa Beach and the KSCVC (KSC Visitor’s Center). As with the last two Shuttle launches, extremely large crowds were expected in the cities surrounding the Kennedy Space Center to witness the historic final launch of the Space Shuttle. 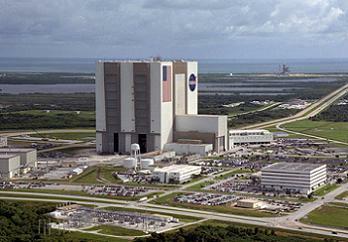 “Expect a similar number of visitors coming to KSC but more in surrounding areas, resulting in increased traffic delays. Teams working terminal count and scrub turnaround should establish manning plans to support a 24-hr turnaround,” notes the Pretest Briefing. While police officers would have been directing traffic after a late-count scrub, with a NASA helicopter providing real-time traffic updates to the Security console, the potential for long-term traffic jams is high regardless as nearly one million people make their way home after seeing the historic launch. Appropriate shift managers would have also been notified if personnel issues cannot be resolved. Had this been the case, the managers would have brought all shift/personnel concerns to the Launch Director and a recommendation to proceed with a 24-hr turnaround and launch attempt would have been made by the Launch Director at the subsequent MMT Tanking meeting. There are two possible LCC (Launch Commit Criteria) deviations/waivers for Atlantis to be utilized during the final part of the launch countdown. 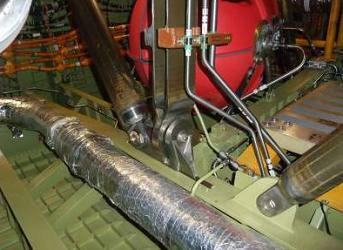 The first relates to the MPS-13 (Main Propulsion System 13) LCC. The suspect wiring was R&Red (Removed and Replaced). Likewise, the second potential LCC deviation/waiver related to SSME-2’s (Space Shuttle Main Engine 2’s) Main Fuel Valve (MFV) LH2 (Liquid Hydrogen) leak seen during the Tanking Test in mid-June. “LCC SSME-02 was reviewed for a possible LCC Deviation/Waiver to the lower limit in Case MFV LH2 leakage is seen again. Had a MFV leakage been seen again during the STS-135 LCD, isolating the leak via securing the circulation pumps would have been appropriate, and the launch team would have tried to gather additional performance data. 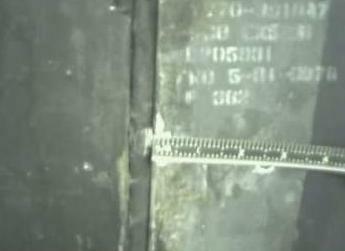 However, the MFV was noted as “rock solid” during the countdown. The presentation also noted that the S1004 Emergency sequence # 5 isolation steps could have been implemented should the leak reoccur. As seen in several recent and usually engineering-only documents, special attention has been made toward recognizing the historical nature of the STS-133/Discovery, STS-134/Endeavour, and STS-135/Atlantis missions. “STS-135 is the 135th Space Shuttle Mission and the 33rd and final flight for orbiter Atlantis as well as the final Space Shuttle mission. And while emotions will have certainly run high as NASA and spaceflight supporters around the word watched Atlantis gracefully lift herself from the launch pad and make one final reach for the stars, the launch team, launch support personnel, mission control, and mission support personnel will, as they have for every single one of the 134 Shuttle missions to date, have done their work with the highest diligence and dedication of any workforce on Earth. (Images: Via Larry Sullivan of MaxQ Entertainment/NASASpaceflight.com, L2 content and NASA.gov. Further articles on STS-135 will be produced during and after her mission, driven by L2′s fast expanding STS-135 Special Section which is covering the live flow to launch, surrounded by a wealth of FRR/PRCB/MMT and SSP documentation/pressentations, videos, images and more.